Vision problems such as nearsightedness, farsightedness, and astigmatism can be treated by a surgical procedure known as LASIK, or laser eye surgery. According to the American Academy of Opthalmology, laser eye surgery involves the use of a laser to reshape the cornea in the front of the eye. When successful, this procedure improves the ability for the eye to focus on objects. However, there are several disadvantages to consider before undergoing this procedure. One disadvantage of laser eye surgery is the risk of having this procedure done. The U.S. Federal Drug Administration (FDA) reports that there are risks of certain complications for eye surgery. As of 2010, there have been no medical studies to determine the long-term effects of laser eye surgery. The FDA reports these possible risks: visual disturbances, such as glare, halos and/or double vision; poor nighttime vision, and the development of severe dry eye syndrome (the patient cannot produce enough tears to keep the eye moist). The development of any of these symptoms is a risk each patient takes when undergoing laser eye surgery. The American Academy of Opthalmology also notes that other risk factors of this procedure are inflammation and infection, bulging of the cornea (called ectasia) and even permanent vision loss. Laser eye surgery may not be as successful at correcting the vision as a person hopes. For example, the American Academy of Opthalmology reports that the patient's vision may be over- or under-corrected, which may require the patient to still wear glasses or contact lenses. The FDA notes that the results are generally not as good when the procedure is used to correct large "refractive errors," meaning vision that is exceptionally poor. For patients who were originally farsighted, the results of the procedure may diminish with age. Even if vision is 20/20 after the procedure, the person may have to wear corrective lenses as he ages. 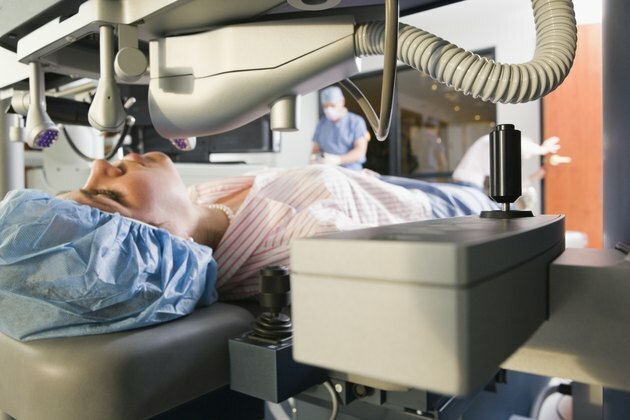 The FDA reports that most medical insurance will not pay for laser eye surgery, meaning the cost for the procedure is out of pocket. This may be contrasted with the out-of-pocket cost for contact lenses or glasses, especially if a person has medical insurance that will pay all or a portion of those costs. The FDA reports there are some symptoms that affect the eyes one to three days post-surgery and other symptoms that may last up to six months. The symptoms that most commonly resolve within one to three days are mild pain/discomfort, burning, scratchiness and overproduction of tears/watery eyes. Symptoms that usually resolve between one week and one month are light sensitivity, hazy or blurred vision, glare, poor nighttime vision and dry eyes. There may be fluctuations in vision up to six months. There may also be a chance that the doctor will recommend further surgery to fix problems or to optimize the vision correction. FDA: When is LASIK not for Me? FDA: What are the Risks? How Long Before Resuming Normal Exercise After a Retinal Detachment?